There's a terrific black and white '60s film called Fail-Safe which, once seen, stays with you, being the super-tense account of a cold war incident which goes disastrously wrong. See that at the wrong age and you'll be scarred for life. Among the cast are big names like Henry Fonda and Walter Matthau. Slightly further down the bill are Larry Hagman and Sorrell Booke. Who? Well, that's JR Ewing, of course, and JD Hogg. Most people, including Sheriff Rosco P. Coltrane, referred to him as Boss Hogg. Died 20 years ago, poor chap. One month back we were luxuriating in the loveliness of the Cookhouse. 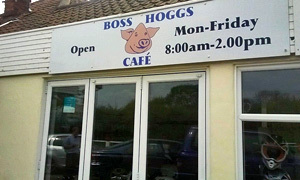 Today we're parked on the rough gravel to the rear of a transport caff, the topically titled Boss Hoggs. So it goes. Lined up out front are a BMW, a Merc and a Jag, all on offer from Select Prestige Motors. Not sure if the garage has the caff attached or t'other way around. Interior is a timeless blend of tiling on a roll and fixed chairs and tables in the great tradition of, say, Kesgrave Kitchen. Location scouting for your '70s noir Suffolk-set existential thriller? You've found it. Today's special is the "mince & onion pie with potatoes and veg". Not quite feeling that, Andy has the straight bacon and egg sandwich. My eye and stomach catch on something weightier: corned beef and egg and chips. Come on! My other body is a temple and all that. Incidentally, wanting to keep in character, Sorrell Booke would happily devour the raw liver that was Boss Hogg's favourite food. Over to the solitary lady who's single-handedly running the place to power up the griddle and rustle up our short orders. There's more than one thick slice of corned beef on my plate. I knuckle down and get through it. Perfectly alright with a can of Diet Coke for balance. Non-Heinz ketchup, though? On the far wall are details of the new arrangements for Operation Stack. On the near wall are driving jobs and ads for 20ft containers. Compared to our usual hang-outs, there's a notable absence of fine art for sale. Though it's nearing the 2pm closing time, we're not alone in here: other manly men, mostly in hi-viz, are occupying other tables. Not even Andy enquires as to the WiFi. Pudding time and it has to be today's sweet special, the syrup sponge and custard. My oh my, that is some retro goodness right there in a bowl. Andy's transported back to his student days of watching Twin Peaks. Good times, Enos, good times. If they were passing by -- Donald Gee.